I won’t say much about the riots in Vancouver after the seventh game of the Stanley Cup Final other than the situation made me really sad. There are times in life where I really fear for the future of humanity. This was one of them. I simply don’t understand the mentality here. What’s the point? I realize that this was a premeditated outburst, that the people who started the whole thing came to Vancouver (from Seattle, from Montreal, from who knows where else) with the express intent of causing mayhem. Whether the Canucks won or lost there was going to be property damage. Otherwise these people would not have shown up with their masks and incendiary devices. What I do not understand is how all those other people could join in or why so many others stood around and took pictures and video while the chaos ensued. Had everyone just left the scene and gone home the police and firefighters would have been able to do their jobs much quicker. Anyway, that’s all I will say about that. I was in the city. I saw the game. I watched the Bruins celebrate (see the photo below) and then my stepson and I went back to our hotel. Sure I was disappointed to see the Canucks lose but not once did I feel like upturning a car or looting a store or punching someone in the face or lighting something on fire. The things that do give me hope are the hundreds of people in the city who came out to help with the cleanup the following day as well as all those who are sending their tips and photos to the police. I have a ton of pictures from the game and the celebration but I will not bore you with them. Instead, I’ll just post one. 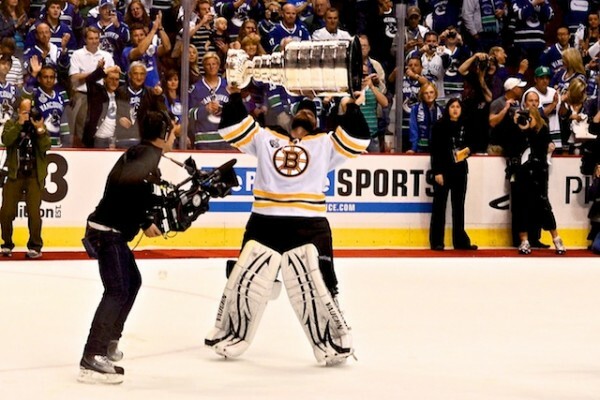 Tim Thomas basically won the Bruins their championship. Here he is (at age 37, an oldster in the hockey world) raising his first ever Stanley Cup. This was a guy who last year got benched for most of the season and then nearly got traded. A guy who didn’t make it into the NHL until he was in his late twenties/early thirties. Who never gave up and persevered against all the odds. And now here he is, not only a Stanley Cup champion but also the MVP of the playoffs who will probably also win the Vezina Trophy for best goaltender. I say this in my talks all the time, but the people who achieve their dreams are often the ones who simply refuse to give up. It’s a lesson I carry with me all the time. Right now I am deep into my rewrite of Call the Shots (the third book in the Swim the Fly trilogy). There are days I think I will never be able to finish this book. My brain has a hard time comprehending the enormity of all the plots and characters I need to tweak and flesh out. Then there are days where I make myself laugh with a tiny aside or a little detail I find amusing and I feel better again. Feel like there is light at the end of the rewriting tunnel. Speaking of writing, I will leave you now so that I can take Tim Thomas’ lesson and get back to the work. Before I depart though, here are two new blogs I did for the UK. The first one is for The Guardian newspaper where they asked me to list my top ten funny teen boy books. I do say in the article that these books are equally funny for girls but I think there is the feeling out there (which I happen to agree with) that boys are underserved in the YA market. The second blog is one I did for The Scottish Book Trust. They are a fantastic literary organization and they helped organize some of my readings in Edinburgh. I was asked to write a blog about my experiences touring Scotland. I’d already written an overview of the entire tour on my own blog so I chose one particular reading to focus on. And, of course, if you haven’t been following me on Twitter then you have no idea what you’re missing.